So far in 2018 we have rescued 18 pups (as of April 2018). This number will rise sharply come summer when the common pups start to arrive, and again in winter when we see the arrival of grey seal pups. In 2017 Seal Rescue Ireland admitted a record breaking number of seal pups, in part due to the many winter storms we had. You might have noticed that they all have unusual names (such as Fred Weasley!) which was due to our unique naming theme: Wizarding World/Fantasy. You can learn more about our 2017 pups and where they came from by checking out our map below! The map shows all of the seal pups who were rescued from far and wide and are currently in care, or who have been in our care, this season. Check out our FACEBOOK for updates about them all! You can even ADOPT ONE if you wish! 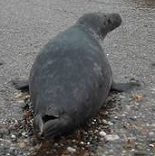 Click on a marker on the map or a name in the list to learn about that seal!